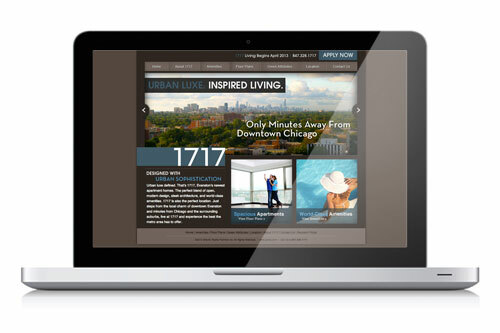 Atlantic Realty Partners (ARP) approached id8 to create a hip, urban brand for their new property, 1717, in Evanston, Illinois. 1717 is a trendy, urban development being built in an ideal location near Northwestern University and just down the road from Chicago. The scope of work included logo design, website design and development, marketing materials such as: brochure with vellum insert, postcard, and a complete stationary system. id8 developed a modern color scheme for the 1717 brand that would set the foundation for all of the other materials created. After creating a very modern logo, we also developed a tagline for the Property: Urban Luxe. Inspired Living. We developed a functional website that worked with the modern, urban aesthetic of the logo, was intuitive to navigate, and clearly delivered information about 1717. We also developed a mini-site to be loaded onto flash drives and an interactive map to feature local hotspots around 1717. 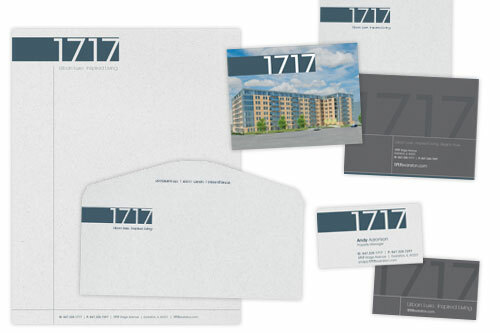 We chose an uncoated paper with a blue fleck that matched the color of the 1717 logo for the marketing materials and stationary set. 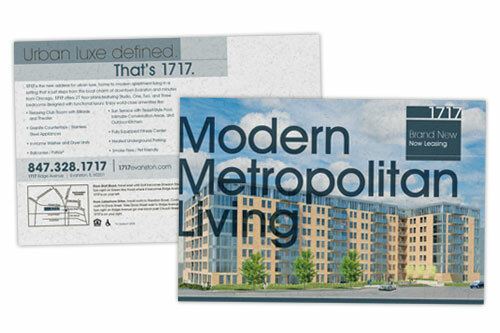 The printed materials were designed to evoke the urban luxe feel of the 1717 brand and highlighted a rendering of the property, along with beautiful imagery that communicated the feel of living in Evanston at 1717. 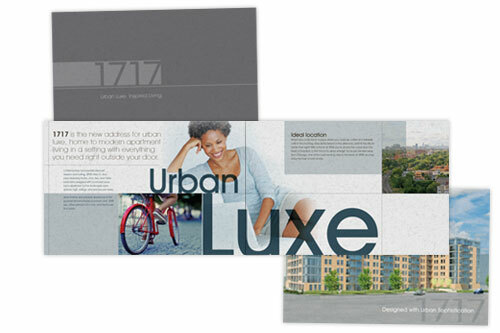 The brochure contained a custom flash drive that launched a mini-website featuring the floor-plans and unique features of the property.